I’ve done most of my digital comics reading on an iPad and a Kindle Fire, though I’ve also attempted a little on an Android phone, iPhone, and PC. Comixology is available on all of these platforms and it’s strong on all of them. It offers users the ability to manage their collection, buy new comics, and of course read them. On larger devices users can chose between page view and guided view. Page view is the pretty much the way it sounds, you’re looking at the comic page just as it would look in a physical comic. This is how I prefer to read digital comics, mostly because it is closest to hard copy comics. Old habits die hard and all that stuff. Guided view on the other hand takes the reader through the comic panel by panel. For larger panels and two page spreads, guided view will move from speech bubble to speech bubble and then finally present the whole page. Depending on your screen size and the font being used, it is sometimes better to use guided view on two page spreads as the font can be hard to read. On smaller screens, such as phones, users are only able to use guided view, provided it’s available. At least on Apple devices, most of the major publishers have their own apps, but in all honesty, the only one that even comes close to the quality of Comixology is the Marvel app. Most of the apps only allow users to look at their own books and have a rudimentary store function. Marvel has more advanced functions than the other publisher apps, but it unfortunately still requires users to have multiple apps in order to enjoy comics from different publishers. 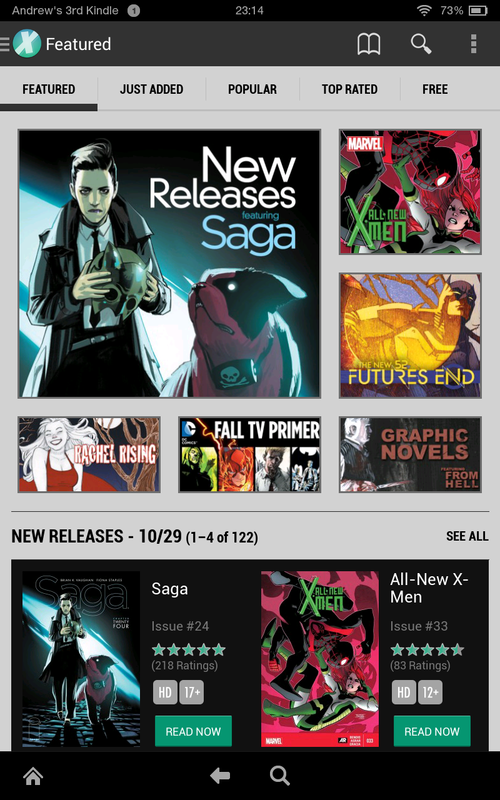 That is honestly one of the greatest strengths of Comixology: the availability of comics from tons of publishers. They also have a great selection of small and independent comics through their Comixology Submit program. Comixology also offers some great sales and comic bundles. I’ve gotten more than a few complete runs thanks to those sales. Featured screen of Kindle Fire app. Comixology isn’t without its drawbacks however. Chief among these issues is that fact that Dark Horse comics aren’t available on Comixology. While many people like the Dark Horse app for its high quality scans of back issues, I would much prefer being able to get all of my books from one source. Another issue that has cropped up recently is exclusive to Apple products. Because the iTunes store takes a certain percentage of each in app sale, after Amazon bought Comixology, they removed the ability to make in app purchases. Users can still buy comics using an internet connection and their browser, but not directly through the app. Also, though many publishers are now offering DRM free backup copies of books that users purchase, Marvel and DC have yet to jump on that bandwagon. Given their corporate parents, I’m not certain that we will ever see DRM free from them. In general, I’ve had the best results on my Kindle Fire. The Kindle app is very robust, probably due to the fact that Comixology is now owned by Amazon. While going all digital isn’t for everyone, I have found it to be a great decision that has enhanced my enjoyment of comic reading.